VLC is a popular video player that can play just about any video or audio file thrown at it. Normally, MP4 is on the support formats list of VLC. However, the issue is that a lot of VLC Player users encounter troubles whileplaying MP4 files in VLC like below users. "I had already download and installed the new vlc Player. I have a mp4 file and can′t play it. With Windows media Player it works great. Have someone a solution or an idea? Thanks for your Support." "I seem to be running into a bug with VLC Media Player. I wanted to play an mp4 file in vlc. Nothing major, I do it all the time. However, after several tries and even updating my VLC Media Player, the apparent bug persists." In fact, MP4 is an open source file container, which means the inside codec would be different from that is supported by VLC. That's why sometimes VLC player would fail to play MP4 files. In this article, we would like to share MP4 to VLC playback solutions to let you easily play MP4 (H.265 .mp4 included) videos on Windows&Mac. To solve the VLC player can't play MP4 files issue, you could firstly update your VLC to the latest version. If this doesn't solve the problem, try to download VLC player MP4 codec packs from CNET. After downloading and installing, this issue should have been solved. If you still can not make MP4 files playable in VLC, we suggest that you'd better change a more powerful player of VLC Alternative. 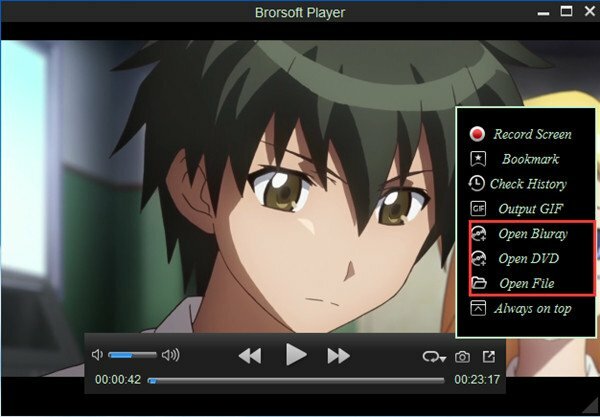 Brorsoft Video Player (Mac version) is introduced here, which supports all video formats like MP4, AVI, FLV, MOV, MKV, WMV, etc. in different codecs like MPEG-4, H.264, H.265, etc. Besides common video formats, it is professional on playback DVD/BD/ISO movies as well. Simply download and run the software; click "Playback" button to choose videos you wanna play. Tip: To play ISO file, a virtual drive should be installed on your computer in advanced. Launch the virtual drive and load the ISO file, then you can operate the same way as playing Blu-ray disc. Solution Three: (Opitional) This solution is supplied by some VLC users which is not identified. But as a possible solution, you can follow and have a try. Open VLC, click Tools --> Preferences. Then in the lower left of the window, click to show all settings. Now navigate to "Input / Codecs" --> "Video Codecs" --> "FFmpeg", in there you'll want to uncheck the box that relates to "Hardware decoding". Close VLC and open it up again, load up your video and see if that works.